Feb 03 19:00:03 650 CIRC 149 EXTENDED [...] BUILD_FLAGS=NEED_CAPACITY PURPOSE=GENERAL TIME_CREATED=2017-02-04T03:00:03.738597 SOCKS_USERNAME="torproject.org" SOCKS_PASSWORD="7d8ea4ccf4ba6345846e0fccacd4d941"
Feb 03 19:00:04 650 CIRC 149 EXTENDED [...] BUILD_FLAGS=NEED_CAPACITY PURPOSE=GENERAL TIME_CREATED=2017-02-04T03:00:03.738597 SOCKS_USERNAME="torproject.org" SOCKS_PASSWORD="7d8ea4ccf4ba6345846e0fccacd4d941"
Feb 03 19:00:04 650 CIRC 149 BUILT [...] BUILD_FLAGS=NEED_CAPACITY PURPOSE=GENERAL TIME_CREATED=2017-02-04T03:00:03.738597 SOCKS_USERNAME="torproject.org" SOCKS_PASSWORD="7d8ea4ccf4ba6345846e0fccacd4d941"
After a timeout occurs, the tor client closes the circuit, builds a new circuit and attempts to connect to the same site again. This repeats at least 3 times. I did an experiment where I connected to ​https://people.torproject.org/~arthuredelstein (a page with hardly any content) and then repeatedly selected "New Tor Circuit for this Site" 50 times. Here are the results for 50 reloads. Each digit represents the number of 10-second stream timeouts observed before a given connection succeeded. In other words 8 out of 50 connections showed a timeout. And interestingly, four of these connections exhibited a double or triple timeout (20 or 30 seconds delay). I think this may be a big part of the perception of Tor Browser as "slow". Actual loading of pages doesn't seem drastically slow to me, and once I have successfully connected to a new site, following links to other pages on the same site (i.e., the same circuit) is usually acceptable. What's the reason for MIN_CIRCUIT_STREAM_TIMEOUT being 10 seconds? Would it do any harm to make this shorter, say 5 seconds or 2 seconds? So many double or triple timeouts are suspicious, because each timeout in a double or triple is reported for a different circuit. Could this mean the connection error is caused by the client or guard rather than a connection failure at the exit node? bug21394_touch_up.patch​ (2.3 KB) - added by Dhalgren 17 months ago. This one is straightforward: if it's 5 seconds or 2 seconds, then people on crummy (slow, lossy) internet connections will forever be giving up on the circuit before they even get the connected cell. The underlying problem is that this is a static number for all users, not an adaptive number like the CircuitBuildTimeout. I feel like I had a ticket long ago for making the stream timeout adaptive too, but maybe that maybe never found its way into being a ticket. 16:49 < arthuredelstein> In general, do connection timeout errors come from the exit node, or from the client? 16:52 < arthuredelstein> Ah, that's a good idea. 16:54 < arthuredelstein> Do you have an hypothesis why there are so many timeouts? Do you think exits are dropping cells? 16:56 < arthuredelstein> in other words, handling at the exit? 16:57 < armadev> is there some pattern with which exits are on problem circuits? 16:57 < armadev> you have the circuit events i hope so you can do the stats? 16:58 < arthuredelstein> another good idea. I will look into that. 16:59 < armadev> people.tp.o has an ipv4 and ipv6 address. can you pick something simple and static that's only v4, and is that different? 17:02 < arthuredelstein> Something that made me wonder if it's something closer to the client or guard is that in my first batch of tests (to people.torproject.org) half of the attempted connections were double timeouts, meaning two circuits with different exits failed before a successful connection was made. 17:16 < arthuredelstein> What's easiest way to send a begin cell? 17:17 < armadev> make a socks request? 17:19 < arthuredelstein> Right. I think Tor Browser is blocking connections to 127.0.0.1. 17:24 < arthuredelstein> I guess I can also try connecting to port 80 of the exit's IP address as an alternative to 127.0.0.1. 17:25 < arthuredelstein> Yeah, I would need to turn off socks isolation. 17:40 < arthuredelstein> And I see you also mention the possibility of instrumenting a browser. 19:49 < armadev> yet another thought: if this happens pretty consistently, can you collude with an exit relay to get debug-level logs at the time of the failure? to see what it sees and what it doesn't see? safelogging might make that harder. 19:50 < armadev> the precursor to that idea is: can you induce this behavior in a chutney network? 19:50 < armadev> i would assume no, because it requires real users, real load, real broken exits. but who knows! 19:50 < armadev> oh, and another: if you're curious if it's your guard, do the experiment again with a different guard! 19:51 < arthuredelstein> yeah, I should definitely do that! 19:54 < armadev> i guess category 1 of problem, you send your begin and it vanishes. you'll never get an answer. 19:55 < armadev> category 2, everything's working, it's just slow/congested, and you need more patience than the hard-coded 10s timeout. 19:55 < armadev> cranking up the timeout should help distinguish, for starters. 20:03 < arthuredelstein> Are there cases where a properly-behaving exit is expected to have category 1 behavior? Or should it always return an error message to the client if a tcp connection fails? 20:10 < armadev> are there bugs? there used to be! we don't know of any now. This happened to me with Tor Browser 6.5.1 after my machine was asleep for 5 minutes. Then, after it went to sleep and woke again, everything worked fine. Guys, the number of timeouts in recent versions of Tor is really unacceptable. It's more bad that even succeeded circuits show timeout after a period of time (e.g. when browsing Trac tickets slowly). So we need to do something with it now. It looks like trac.tpo is always resolved as IPv6 address, and Tor switches through the exit nodes until one with IPv6 support found. #21310 and #21311 may fix this, but we might also need a fix on the client side. where each digit represents an attempt to connect, and the number of timeouts before the connection succeeded. So to me it doesn't look like IPv6 is the (only) problem. 15/50 attempts included at least one timeout. About half had more than one timeout. Indeed I got 9/50 timeouts for the domain with http or https, but no timeouts for IPv4 and only a single timeout for IPv6. Does this ring any bells for Tor core experts? What might be happening with DNS here? Again I think the multiple timeouts are a little suspicious, and I don't quite understand how that jibes with it being a (pure) exit node problem. Does this ring any bells for Tor core experts? What might be happening with DNS here? Some exits may be overloading their resolvers. Or our code may be buggy. It would be helpful to identify the particular exits that are experiencing these timeouts, and work out if they are in the same AS or using the same resolvers. I also wonder if we should ask bandwidth authorities to use DNS whenever possible, so they see DNS timeouts, and downgrade exits that have them. See #24010. Again I think the multiple timeouts are a little suspicious, and I don't quite understand how that jibes with it being a (pure) exit node problem. The only node in a tor path that uses DNS is an exit, so if DNS breaks, it causes issues at the exit. Makes sense. If the DNS resolve fails at an exit, does the exit send an error message back to the client? Or does it silently fail, meaning the client has to wait for the full 10-second timeout? Nice idea. Would it also be feasible to have exits periodically run diagnostics to see if their DNS resolution is working properly, and if not, report the problem to bandwidth authorities and notify their relay operator? That seems sensible. I'm only a little puzzled that it seems more common than I would expect that I saw not a single timeout, but a double, triple or quadruple timeout (see instances of 2,3,4 in my raw data). Presumably it's switching to a new exit node after each individual timeout, so why do I frequently see multiple timeouts for a single connection? Maybe it's just bad luck, but it made me wonder if I'm seeing something that goes wrong for the whole connection attempt and not just individual circuits. It depends on how it fails. If the resolve fails fast, a an error cell is sent to the client. I don't think we can make this faster. Yes. Exits already check DNS at startup, and turn off exit traffic if it fails. I opened #24014 in 0.3.3 to make them check periodically. There's no way for relays to report anything directly to the bandwidth authorities. Instead, relays modify their descriptors in response to self-checks. In this case, the relay would disable exit traffic until a DNS check succeeds, and clients would find out about it when they next download its (micro)descriptor after the next consensus. and notify their relay operator? Yes, this would be part of #24014: we will log a warning when we disable exit traffic. But the most likely explanation is that some exits are massively overloaded, and DNS bears the brunt of that overloading. We could encourage relay operators to use a local DNS cache, but threads on this come up every month or two on tor-relays, so I'm not sure starting another would be useful. I would suggest that we find a way of monitoring this, so we can check if our fixes make a difference. This might be a task for metrics, I'll leave it to you to open a ticket, because you know what needs to be done to test for timeouts. There's nothing in this ticket that core tor can bugfix in 0.3.2, so I'm moving it to 0.3.3. OK, good to know a fast fail is reported by through the circuit. I only wonder if it's possible there could be a bug in sending or receiving that error that makes it fail sometimes. I believe I've seen the same failure rate on a couple of different guards but I should investigate that further. Good idea -- I opened #24018 for that. The script creates 2-hop circuits. Each exit was tested 5 times for example.com and 5 times for '93.184.216.34', the bare IPv4 for example.com. with about 5 attempts made per address/exit combination. I did a quick analysis of the data and found the following. For the raw IP address, the overall timeout frequency was 1.39%. 3 exits always timed out, 29 exits sometimes did, and 752 always suceeded (the rest were assorted fast failures). For example.com, the overall timeout frequency was 9.03%, 41 exits always timed out, 74 sometimes did, and 653 always succeed (again the remainder were other failures). It's interesting that the observed timeout frequency here was only half that observed in comment:20. Perhaps that's because here I tested all exits equally, instead of using consensus weights to choose exits as Tor Browser does. But I would have expected more timeouts, not less, if I use the low bandwidth exits more, so I'm surprised by that. In any case, if the timeout probability were uniformly 9% for all exits, I would expect essentially no cases of an exit failing 5 out of 5 times. So it's clear that the probability of some exits failing is much higher than others. Therefore we have "bad" and "flaky" exits. That trend explains why I see higher timeout frequency with Tor Browser than with my DNS timeout survey script. This isn't surprising to me, but it's good to have some data. I've noticed that guard relays I run in particular locations (east coast US, west coast EU) are overloaded, and others have told me that their exits in similar locations are also overloaded. We could also find and map overloaded relays, or relays with higher than average consensus weight to bandwidth ratios. That would help us find out if our changes are making a difference. I opened #24045 for this. The number of stream timeout events were substantially reduced relative to comment:27. It's not a perfect comparison because this was done on a different day, and the total test time took substantially longer. But it does seem to suggest that DNS services for some of the exits are very slow, but not disabled. Next I can look at the distribution of DNS response times. Then I plan to contact some exit relay operators with poor DNS response and see if they can investigate why their DNS is slow to respond or broken. Total responses later than 10 seconds: 3.45%. Again, this is worse than comment:27, but the discrepancy shows the importance of DNS to delayed responses. #18580 could be very relevant here? So yes, I think that bugreport is very relevant here. I think this is a libevent bug/an unfortunate issue with how libevent and unbound interact. By default libevent only allows 64 DNS requests to be inflight at the same time. When asking unbound to resolve something and the dns server in question nullroutes traffic from unbound, it takes longer than named to reply with a SERVFAIL. (named's timeout matches what Tor uses). So if a bigger dns server operator decides it has gotten to many queries from a relay, reaching that limit of 64 inflight queries happens in absolutely no time and all other DNS requests get queued. There may be an additional issue where we're marking our local unbound as down because it didn't reply quickly enough to a query we made, because it's still trying to answer it. Combined this would easily explain why DNS gets wedged completely. We REALLY need a high-volume exit operator to help us debug these assumptions. to their resolv.conf, and restarted their exits. Unfortunately gamambel's relays seem to have gone down entirely so they're missing from these results -- not sure if the reason is related to the new settings. I will run the test again when they're back up. I think it's at least promising that DNS is working on pastly's exits. It will be especially convincing that we have found the cause if we revert the resolv.conf settings and DNS stops working again. gamambels exit relays are back up! And interestingly, two of them (HaveHeart and sofia) are showing bad DNS, and one of them (CriticalMass) is showing good DNS. Both of pastly's exits are also showing good DNS as they did in the previous comment. All 5 exits (HaveHeart, CriticalMass, sofia, StanMarsh, KyleBroflovski) had no timeouts! That's quite promising. I'm going to keep running the test today to see if that good behavior persists. And maybe after that we can revert resolv.conf and see if the timeouts reappear. In short, our 5 exits showed absolutely no timeouts. In the three rounds in this comment and one round in the previous comment, we had 5 tests per exit connecting to example.com. So that's a total of 100 tests with no timeouts. Next, I would like to try reverting resolv.conf for these exits and see if DNS starts causing timeouts again. We see that two of gamambel's exits (HaveHeart and sofia) show significant timeouts, while CriticalMass (as we saw before in comment:37) does not. pastly's exits (new settings) again show no timeouts. to completely inhibit the timed-out "down resolver" logic. where it turns out that max-timeouts is capped at 255 by eventdns.c. Will create a patch to remove the 255 limit on next Tor daemon update. . .
Would include the patch but I appear to have overlooked writing it. Note that the patch *is not* the diff above. I like the branch, am happy it got some testing from moritz, and look forward to seeing it in our upcoming alpha. No timeouts in gamambel's exits. Tell tor-relays that they can either switch to the new alpha, or apply the workaround to their resolv.conf manually, or sit tight to await the results of the broader deployment. options timeout:5 attempts:2 . . .
For added fun, the client starts its 10 second timer when it sends the begin cell, so if it takes x seconds for the begin cell to make it to the exit, and y seconds for a response (failure *or* success) to make it back to the client, then the exit needs to do its thing in 10-x-y seconds or it won't happen in time. Typical values of x and y are 0.5 seconds. So, approximating things as 10 seconds is not crazy, but don't plan to be doing anything new at the 8 or 9 second mark and expect it to have as much impact. I should also point out that the client's *first* stream attempt is 10 seconds, but subsequent attempts (once it's given up on the first one and tried a new circuit) are 15 seconds each. Unbound displays impressive patience w/r/t completing queries. Arrived at 0.46 by taking the percent of successful resolves under 16 seconds. Is 0.36% relative to queries resolved in under 16 seconds plus resolves from cache. 2.47% of queries resolve in over 16 seconds, are lost. Just noticed the handy Unbound statistic "requestlist max X avg Y". Going back I see typically the maximum pending DNS query list runs around 600 with an average length of around 300. Max has been steady but average tripled over 12 months to the present value. Occasional extreme case is 3000 for a day, sometimes two. Or simply eliminate overrides for attempts: and timeout: as the defaults are acceptable in both the named and Unbound cases. Key elements here are max-inflight: and max-timeouts:. I'm fine with merging Sebastian's patch, though I see there is more discussion following. Dhalgren, how would it be if we took Sebastian's patch in 0.3.2 now, and then discussed further fixes as changes on top of that? As an alternative, I'd also look at another patch, but I'm hoping to get this fix tested in another 0.3.2 alpha to be released early this week. I'm not sure that retrying is a good idea in general. Clients can just try a different exit node. This should be a rare occurence anyway. As for overwriting resolv.conf values - yes, that happens, but libevent doesn't expose an API to do it a different way afaict. We do it already for some stuff. Maybe an acceptable alternative is to allow overwriting these values via torrc parameters? Maybe an acceptable alternative is to allow overwriting these values via torrc parameters? Backported Sebastian's branch to 0.2.9 as bug21394_029. Now merging it to 0.3.2 and forward. If it works out, let's backport some more. Restoring keywords and release that were reset in this comment. Thanks to Dhalgren, Sebastian, arma, gamambel and pastly for your work on this! I ran two bwauths, that had no differences between them, and calculated the average difference between two sets of relays for each consensus: the set of all relays, and the set of relays where the bw measurement was above 100 in both bwauths. 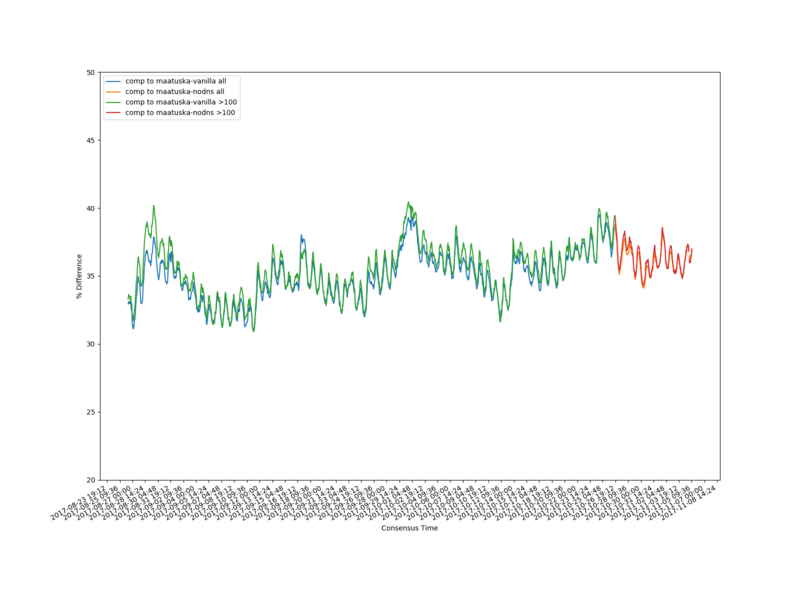 That data (the blue and green lines) are the control. Then I changed one bwauth to connect to the final destination using an IP address and left the other one connecting using a DNS name. That data is the the orange and red lines. I don't see much of a difference. So it seems that bwauth measurements were not affected by this issue. Backported this to 0.2.9 and forward. I'd like to close this as fixed; can we un-parent the children? Solution is not complete per comment:58. I am willing to work on it if the devs are willing to bring any issues the have to me rather than hacking on my patch as past experience tends to indicate. Solution is not complete per comment:58. We try to make backported fixes small and obviously correct. Is there a critical issue that stops this patch working on most machines? If so, please continue on this ticket. If not, please open another ticket targeting 0.3.3 for further improvements. I am willing to work on it if the devs are willing to bring any issues the have to me rather than hacking on my patch as past experience tends to indicate. I'm sorry, I'm not sure how we failed here, but it's clear that we made some mistakes. We discuss patches on the bug tracker and #tor-dev. For backported emergency fixes, whoever is available does the work, and we try to get it done as soon as possible. Sometimes this means that things get forgotten or people get left out. I'm sorry about that. If you want to tune the parameters, please open another ticket, and we will have more time to consider it. A correct patch will be only slightly larger than the existing patch. Adding tuneable parameters is trivial, requires one line for each in or.h and in config.c, and one expression to obtain the value. The current patch discards successful DNS replies that arrive between 5 and 15 seconds and while the percentage of queries affected is small, the behavior is incorrect. If an operator configures a single named resolver, no retries whatsoever are attempted. 0.2.9 will be around for two more years and a minor incremental effort towards correctness seems in order. My experience with open source is core developers generally feel compelled to change everything contributed to "make it theirs," without involving the contributor; has left me nonplussed. The bugfix patch in this ticket has been backported and merged, so any new patch has to be built on top of it. We try to avoid tuneable parameters, because we have to test each option that we put in a torrc. Also, tuneable parameters are a new feature, so they won't get backported. Ok, thank you for describing the issue. Please submit any bugfix patches based on maint-0.2.9, and we'll test it in master, then consider backporting them. Please submit any feature patches that add new options based on master. And please use separate tickets for feature and bugfix patches. Otherwise, people are more likely to get confused, and they won't see all of your work. I know I do it myself sometimes, but I try not to. I don't know exactly what happened in this case, and it's hard to tell by reading the ticket history. Please also understand that sometimes we change things so they are more maintainable. I will submit a minimal revision this coming weekend to correct the second paragraph issue, and open a enhancement ticket for tuneable support then as well. The change is to simply to have the one-resolver case set three attempts with a five second timeout, or perhaps five attempts with a three second timeout and I don't feel that has to completed by me if it is expedient for someone else to do so. Requires changing two characters, literally. I uploaded my suggested revision. Targets maint-0.2.9 as requested. Setting to needs review for Dhalgren's touch-up patch in the previous comment. I am not sure that retrying in the case of named is actually beneficial, which is why I didn't include it in the patch. Even if we succeed on the later retry it's unlikely that the client will actually benefit from that, because it will also give up on the request. I had no intention to slight you in any way, I felt that I pushed very hard to actually get your work here recognized and a proper fix merged after your contributions had unfortunately been ignored for a very long time. I am just a volunteer myself and spending this time because I care about having a good outcome for the network. I feel that it is unfair to suggest that anything I did on this bug I did to make this "mine" or to receive undue credit. I made sure the release notes mention your work and have tried to make everyone aware of who did the analysis. We happen to disagree on a technical point, but that should not be conflated with social issues. I'm not following the line of thought. If evdns.c (in libevent) re-attempts the request at five seconds and succeeds, the client knows nothing about it. All the client knows is that it required six-seven-whatever seconds for the circuit connection to complete. In the retried-circuit scenario, it could take twelve, thirteen, on the outside fourteen seconds for success. Admittedly this will rarely matter (my Unbound histograms say about 0.5% of requests), but if attempts=1 timeout=5 is set, then the exit will literally throw away responses arriving after five seconds and the client will twiddle its thumbs for the remaining five or ten seconds of its timeout interval with no chance of success. My understanding is that evdns all-retries-exhausted events are _not_ relayed back to the client. Very sorry for any misunderstanding! I was not referring to you or anyone on this ticket above. I was expressing my trepidation at spending time contributing in general because several times in the past I submitted carefully thought-out code changes (to Tor and other projects) that were summarily hacked on for no obvious reason, and without involving me. Took much of the enjoyment out of it. In regard to this issue I am rather liking the experience. I spent about six weeks understanding the problem, working on the fix, following up the results and documenting what I found on the wiki, and it's a pleasure to have the work recognized and for it to effect a critical improvement to the network--though my original motive was simply to tame a single berserk relay. Except those that should not have been reopened. They still need review, but they won't be backported to 0.3.0. Sorry, they didn't get reviewed, because they were assigned to the wrong release. Mark needs_review tickets as included for 033. We can revisit this if they turn out to need much more review and/or revision than expected. Ok this is a long ticket (with great analysis by all!). I want to clarify a few things here to make sure I understand the situation, since this was closed and reopened and there was already some confusion about target versions. https://trac.torproject.org/projects/tor/attachment/ticket/21394/bug21394_touch_up.patch is the only thing under consideration for merge, and we're targeting it on 0.3.3. (sha256: f81fbbbdae31dcf643ab87feb70386d2209d4c73bc38479d7a4c798a0d51115b since attachments can get changed). That patch sets the "attempts" parameter to 3, since a timeout after 5 seconds can be retried once more when the connection timeout is 10 seconds, and twice more when the connection timeout is 15 seconds (on retries), totaling 3 attempts in the 15 second case. We're also raising max-timeouts in the multiple resolver case to be more patient with resolvers there, too. All of this seems sane to me. Ok, the patch has been applied in mikeperry/bug21394_033. Branch is off of maint-0.3.3. Author string has been set as requested. I've rebased mike's branch onto maint-0.2.9, in case we decide this is a good idea to backport. The new branch is called bug21394_029_redux. I've merged that branch into 0.3.3 and forward.